Whenever we hear of saffron, skin lightening comes to our mind. In Ayurveda, saffron is used extensively for its skin lightening properties. I will review Iraya Saffron Elixir that I had used ever since I got that. Now, that is just one fourth the quantity left, I left it to hop on to some other product. 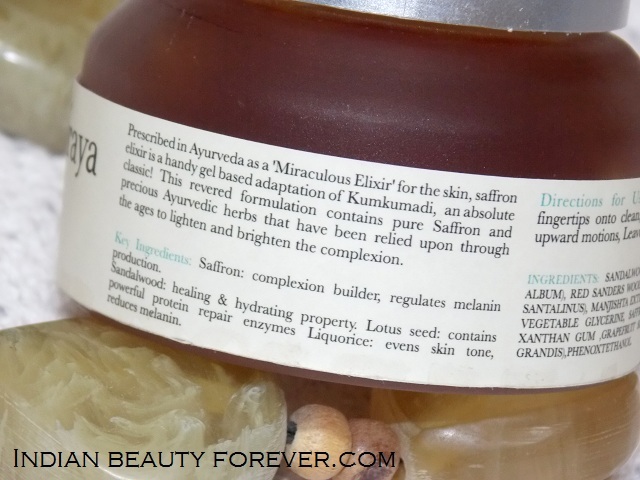 It says: Prescribed in Ayurveda as ‘ Miraculous Elixir’ for the skin, saffron elixir is a handy gel based adaptation of kumkumadi, an absolute classic! 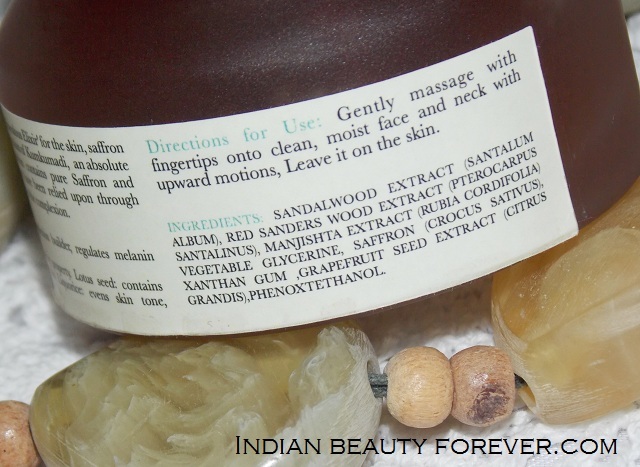 This saffron elixir is relied since ages top lighten the skin and brighten up the complexion. Views: Iraya saffron Elixir comes in a heavy glass jar with a silver lid. It looks a lot like the big daddy version of Maybelline gel liner packaging. I find it cute though. I liked the packaging but at the same time, I worry what if I drop it considering that I do have slippery hands. :D Yeah, I do. I tend to drop things. 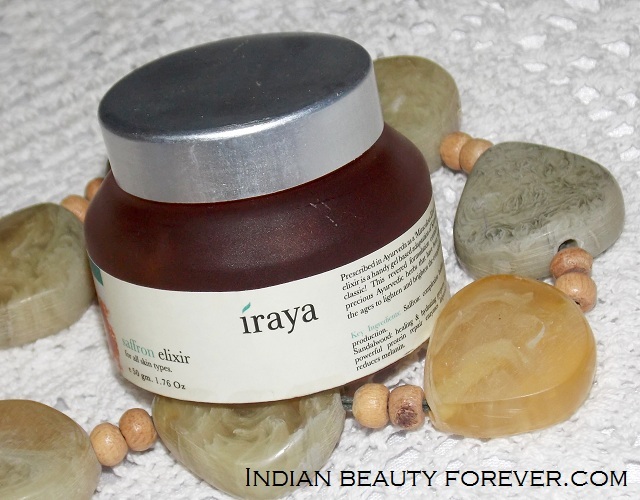 I like Iraya as a brand since it is herbal and by that I mean they truly are! With lesser chemicals, 100 % vegetarian and their products are never tested on animals. Yaay!! It's hard to find good herbal brand with no animal testing. This is what makes me love this brand. Iraya saffron Elixir is not like a regular gels, It has a gel like consistency but it is not smooth. If you'll look at the pictures, it is more like the jelly thing that we eat. A pea size of this elixir is enough for one time. While I apply this, at first it will feel watery as if I am massaging my face with some water gel type of liquid but soon it starts to feel sticky and within minutes, it will just evaporate and skin feels velvety. I quite like that velvety and satiny feel that I have after using this. In fact this feature of this Iraya saffron Elixir is what makes it a good day and night moisturizer/skin nourisher for combination to oily skin. I have noticed that my skin remains oil free for a bit longer with this on. It kind of delays the oil production for some time as compared with not using anything at all. 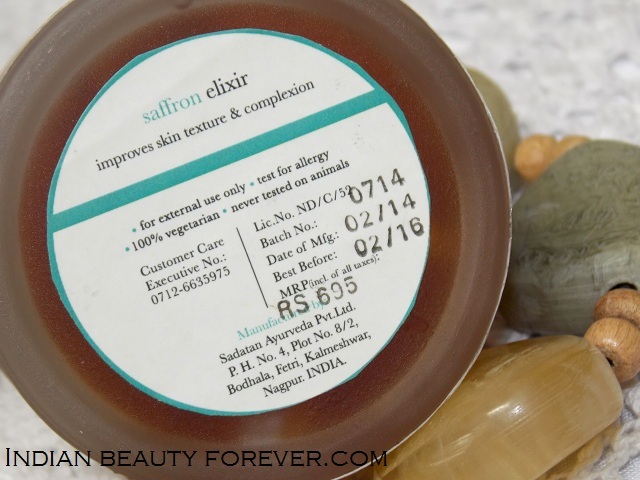 For oily to combination skin this saffron elixir is excellent, it has fared wonderfully though for normal to dry skin, this alone will not be able to give sufficient moisture therefore a moisturizer or some lotion will also be required after using it. Since the time, I have used it, I have not faced any allergies from any of its ingredients or any breakouts which I am mostly concerned about. By the way, you can check the ingredients in the picture above. I have observed that some of the dark spots on my left cheek which were the pimple scars have been faded and I really felt that it does improve the skin appearance. My skin looked brighter, if not lighter. This entire jar should last more than a month so that way I feel that it is expensive for 695 bucks but honestly the way it feels on oily skin, I really don't mind the price as there are very few products that can actually suit oily/combination skin especially in summers. I used in in the month of scorching July which made me say that. Take: Iraya saffron Elixir is a light weight, easy to absorb, watery gel formula that makes skin velvety and isn't greasy at all. This feature of this saffron gel/elixir makes it good for oily to combination skin. It is slightly expensive but if you’re looking for a gel based non greasy product for your oily/combination skin then it is worth it. On the other hand. for dry skin, it won’t be able to hydrate that well but still can be used prior to a moisturizer to fetch the benefits of it's ingredients. Thank you Harine!! It is. you are correct , finding a product that suits oily skin is a miracle! I might try this one, I have a few pimple marks on my cheeks. Truethat! I am glad that this atleast suits oily to combi skin. 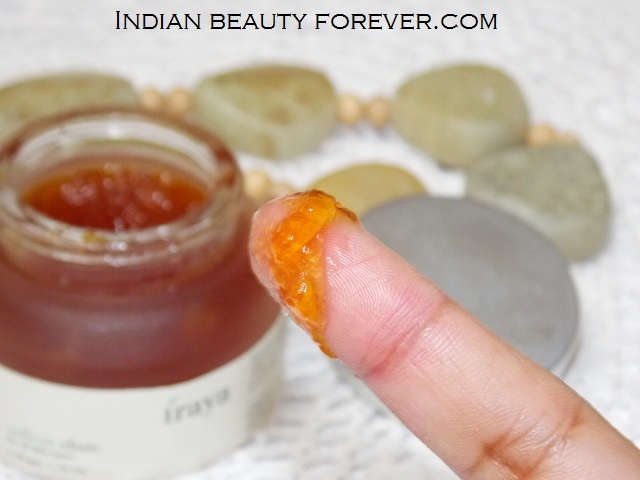 I've never tried any products from Iraya yet. I'm surely getting this one I finish my existing stuff. This was my very first product and I ma glad that it worked well. Do give it a shot!! Iraya products are good, wish they change the packing. I find the packaging to be okay!! Thank you Dear. I am fine now! Great review niesha n lovely clicks. . I have been using this for quite a few months and absolutely love it. Well reviewed honey! Thank you hun!! I liked its texture. Love your detailed review! This gel seems to be a one and unique product! I liked that it's good for oily skin. This sounds wonderful.. i have tried their manjistha eye gel. Thank you Hun! :) I want to try that eye gel too. Wow, this looks like such a luxurious skincare product! I love the thought of this jar product, I personally don't like glass packaging but I would be willing to try this if I had the chance! That's great that your skin has improved too! I too don't like the jar glass packaging but if the product is good, I can overlook that. I liked that their products are not animal tested and free from a lot of chemicals that are used as preservatives.